Fanny Bay is located 30 km (19 miles) north of Parksville and 24 km (15 miles) south of Courtenay on Hwy 19A. 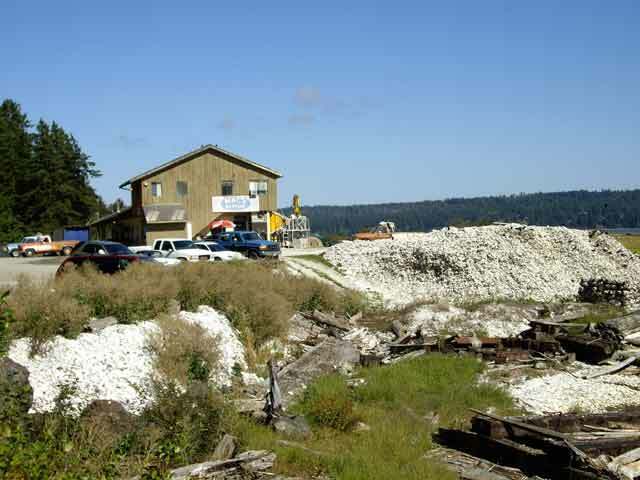 Fanny Bay is well known on Vancouver Island for world-famous oysters and the infamous Fanny Bay Inn. Entering Fanny Bay from the south on Hwy 19A, you'll arrive at a historic pub called the Fanny Bay Inn. Fondly called the F.B.I., the inn was established before the change in pub legislation in the 1970's. The F.B.I. 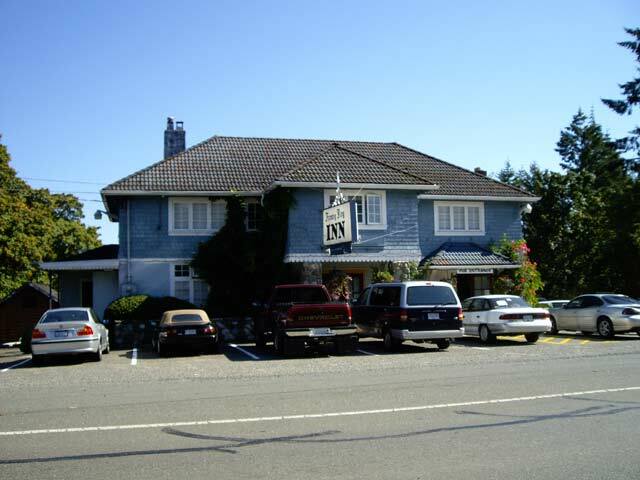 was one of a handful of roadside inns located in the province of British Columbia with an authentic British pub feel to it. Most of the other pubs have long disappeared. The rest of the community is quite small and is situated right on Hwy 19A. At one time, before Hwy 19 was built, Fanny Bay tended to be quite busy with the large volume of traffic travelling up and down the island. Today the community is a little more quiet and mellower, making it an ideal retirement community. If you happen to enjoy fresh oysters, try visiting Mac's or Fanny Bay Oysters for the very best. Both companies have been in operation for many years bringing the very best shellfish product into the market place from the rich and productive waters of Baynes' Sound. Another landmark as you drive through Fanny Bay Inn on Hwy 19A is the Brico. 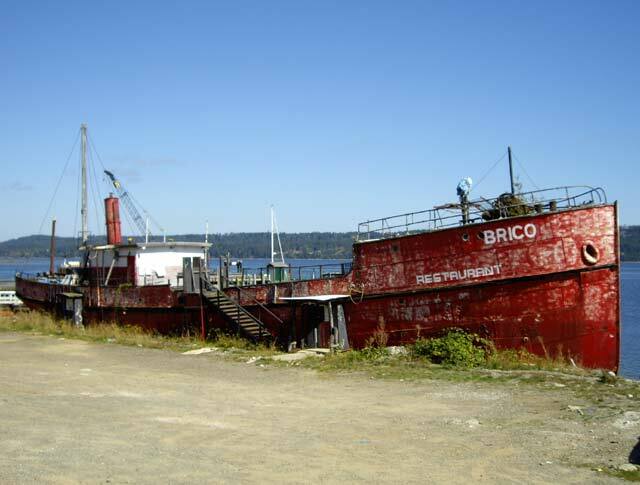 Once a cable-laying ship, the Brico, was beached on shore, later to serve as a restaurant. Today it sits on the shores of Fanny Bay as a friendly reminder of days gone past. Next door to the Brico is another landmark, Mac's Oysters, with its familiar piles of oyster shells along the waters' edge. Help forming Fanny Bay on the south end of the community is the Ship Peninsula that projects out towards Denman Island in Baynes Sound. Here you can find a beautiful housing subdivision that was developed in the 1970's. On the south side, there is Ships Point Regional Park that features a gravel beach full of small tidal pools that are teeming with various forms of sea life. Ships Point Regional Park is also a popular spot where the locals go windsurfing. Other exploring on Ships Point includes some of the tidal flats along the oceanfront. The marshes and beach area found here are an abundant source of nutrients for the large number of bird species and wildlife that make Fanny Bay their home. The trail to the marsh through the area starts near the parking at the end of Tazer Road. Fanny Bay sits right across the Baynes Sound from Denman Island. With boat launches located either from Deep Bay or Fanny Bay, you have the opportunity to visit some of British Columbia's best scuba dive and beach areas. One of these is the sandy beach at Tribune Bay on Hornby Island which is just across from Denman Island. On Denman Island, go to Sandy Island Provincial Marine Park. 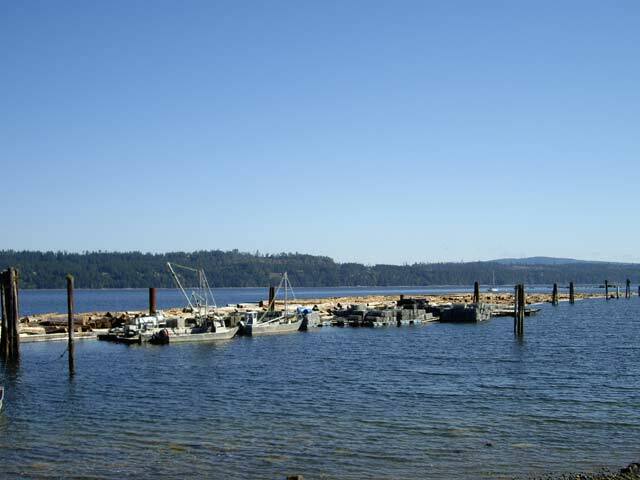 If you don't have a boat but would like to visit Denman or Hornby Islands there is a BC Ferries terminal situated just north of Fanny Bay at Buckley Bay. Located only 5 km (3 miles) north, you will have to take two ferries to get to Hornby Island. There are a number of Bed and Breakfast establishments in the Fanny Bay area, especially along Ships Point. For provincial parks, the nearest one is at Rosewall Creek Provincial Park just south of Fanny Bay but, unfortunately, there is no campground.